Do you need to switch between a modern, clean, compressed, chorused tone and a vintage, dirty, dynamic fuzz tone? Like instantly? The Skreddy Pedals™ Dual Loop allows you to alternate between two distinct effects loops with a single stomp switch, without the heavy investment in midi switchers or having to run everything through buffered, electronic switching gear. Everything is mechanically true bypassed with no active electronics messing with your tone. The Dual Loop features hardware true-bypass switching, 2 bright LEDs, a DC jack, and a 9v battery clip (battery not included). No power is even required except for the LED indicators. The little Dual Loop will help conserve your precious pedalboard real estate while adding easy-to-use routing power and efficiency. One in, one out, and two independent effects chains at your command. Can also be used as an amp selector or as an instrument selector. 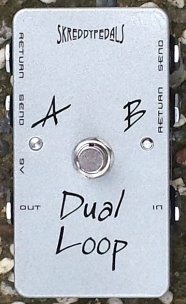 Put one first in your chain to serve as a global bypass for your whole pedalboard or instantly switch between two entirely different pedalboards..
You can use several Dual Loops to alternate between and/or true-bypass as many different sections of your effects chain as you want. Plug your guitar into the "IN" jack and connect the "OUT" jack to your amplifier. Connect the "SEND" jack of loop A to the input of the first effect, and connect the output of the last effect to the "RETURN" jack of loop A. Loop B will be a true bypass if nothing is plugged into its "RETURN" jack. Connect your second chain of effects in the same way to loop B. "OUT" still goes to your amp, but connect instrument 1 to the "RETURN" jack of loop A, and connect instrument 2 to the "RETURN" jack of loop B.
Connect your guitar to the "IN" jack. Connect the "SEND" jack of loop A to the input of amp 1, and connect the "SEND" jack of loop B to the input of amp 2. Note: this method does not silence the un-selected amp, so it may hum.